Virgil is a member of the Pokemon Rescue Squad, the leader of Team Eevee, and an extremely powerful trainer who was able to win the Isshu League. Anna (アン ナ) and Oscar (オスカー) / ??? and ??? Both Anna and Oscar were helped by Mewtwo in the past. 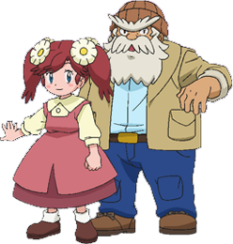 Anna is a mysterious girl who is able to understand the feelings of pokemon while her grandfather, Oscar, used to be a member of the rescue squad out in the mountains. Like Anna and Oscar, Dunk was also helped out by Mewtwo in the past. Dunk seems to know a lot about the man-made pokemon...but what is he after?